Severe hemorrhage leads to decreased blood flow to tissues resulting in decreased oxygen and nutrient availability affecting mitochondrial function. A mitoscriptome profiling study demonstrated alteration in several genes related to mitochondria, consistent with the mitochondrial functional decline observed after trauma hemorrhage (T-H). Our experiments led to the identification of sirtuin 1 (SIRT1) as a potential target in T-H. Administration of resveratrol (a naturally occurring polyphenol and activator of SIRT1) after T-H improved left ventricular function and tissue ATP levels. Our hypothesis was that mitochondrial function after T-H depends on SIRT1 activity. In this study, we evaluated the activity of SIRT1, a mitochondrial functional modulator, and the mitochondrial-glycolytic balance after T-H. We determined the changes in protein levels of pyruvate dehydrogenase kinase (PDK)-1 and nuclear c-Myc, peroxisome proliferator-activated receptor-γ coactivator (PGC)-1α and NF-E2-related factor (NRF)2 after T-H and after treatment with resveratrol or a combination of sirtinol (a SIRT1 inhibitor) and resveratrol. We have also tested the activity of mitochondrial complex 1. SIRT1 enzyme activity was significantly decreased after T-H, whereas resveratrol treatment restored the activity. We found elevated PDK1 and c-Myc levels and decreased PGC-1α, NRF2 and mitochondrial complex I activity after T-H. The reduced SIRT1 activity after T-H may be related to declining mitochondrial function, since resveratrol was able to reinstate SIRT1 activity and mitochondrial function. The elevated level of PDK1 (an inhibitor of pyruvate dehydrogenase complex) after T-H indicates a possible shift in cellular energetics from mitochondria to glycolysis. In conclusion, SIRT1 modulation alters left ventricular function after T-H through regulation of cellular energetics. Severe hemorrhage can lead to multiple organ dysfunction and death (1,2). Hemorrhagic injury leads to whole-body hypoxia and decreased availability of nutrients to all tissues (3, 4, 5, 6). Reoxygenation by fluid resuscitation leads to further oxidant injury. Severe hemorrhage, therefore, presents a complex model with alterations in multiple biochemical pathways (7, 8, 9). Models of trauma hemorrhage (T-H) have clearly demonstrated sustained organ dysfunction despite fluid resuscitation (7,10,11). Methods to improve organ function and reduce tissue damage are therefore cardinal to resuscitation methods. Hypoxia leads to dysregulation of cellular energetics possibly due to altered mitochondrial function (12,13). Mitochondrial functional decline results in decreased ATP production, fatty acid oxidation and increased reactive oxygen species (ROS), and mitochondrially generated ROS may lead to further mitochondrial dysfunction (13, 14, 15). When cellular oxygen availability decreases, mitochondrial oxidation is suppressed and glycolysis is promoted (16). This result was evident in our experiments using cardiomyocytes subjected to hypoxic conditions (17). We observed an increase in the gene transcripts for glycolytic enzymes, aldolase 3 (Aldoc) and hexokinase 1 (Hk1), indicating augmentation of glycolysis. We found that transcription of seven of the ten genes involved in the glycolytic pathway was elevated in the cardiomyocytes after hypoxic exposure (17). There was also a significant increase in the expression of PDK1, which phosphorylates and inactivates the pyruvate dehydrogenase (PDH) enzyme. PDH functions in the conversion of pyruvate to acetyl CoA, a substrate of citric acid cycle and the inhibition of which declines mitochondrial oxidation, thereby controlling excess ROS production (18). 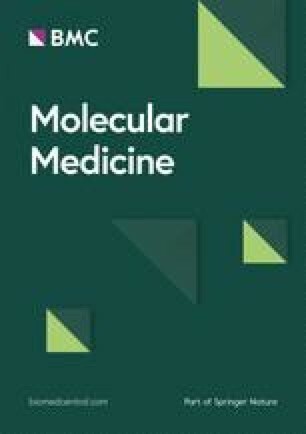 In another recent effort to further understand alterations in molecular pathways due to T-H, we profiled the mitoscriptome of left ventricular tissues after T-H and resuscitation, using a custom mitochondrial gene chip and found elevated expression of hypoxia-inducible factor a (Hifα) and hexokinase 2 (Hk2) genes (19). We also observed significant upregulation of c-Myc in the left ventricular tissue of rats after T-H. We further discovered a decreased expression of sirtuin 1 (SIRT1) protein after T-H (20). SIRT1, a longevity-associated protein, is important in maintaining mitochondrial function (5,21, 22, 23, 24). On the basis of these results, we postulated a possible c-Myc-SIRT1 regulation in T-H (20). Our further studies have demonstrated that resveratrol, an activator of SIRT1, improves left ventricular function and restores expression of peroxisome proliferator-activated receptor-γ coactivator (PGC)-1α and peroxisome proliferator-activated receptor (PPAR)-α (5). The deacetylase function of SIRT1 depends on the cofactor NAD+ and therefore on cellular energetic status. One of the conditions necessary for the activation of PGC-1α is its deacetylation, a process carried out by SIRT1. PGC-1α, 1α coactivator of PPAR-α, is important in the regulation of mitochondrial biogenesis. Therefore, because SIRT1 acts as a metabolic sensor, it can have a profound effect on mitochondrial biogenesis and function. The changes in SIRT1 activity or the level of transcription-modulating factors such as PGC-1α or NF-E2-related factor (NRF)2 in the nuclear compartment, after T-H or resveratrol treatment, are not known. Therefore, in this study, we tested the alteration in enzyme activity of SIRT1 after T-H in resveratrol-treated and -untreated rats and further investigated the energetics imbalance after T-H by studying the mitochondrial-glycolytic shift. T-H was induced in male Sprague Dawley rats (Charles River Laboratories, Wilmington, MA, USA) and was reported before (5). Briefly, rats were anesthetized and a midline laparotomy was made in both the sham and hemorrhage groups. In the hemorrhage groups, both femoral arteries and the right femoral vein were cannulated. After the animals were awake, 60% blood volume was withdrawn over 45 min to attain mean arterial pressure (MAP) of 35 ± 5 mmHg, and this low MAP was maintained for another 45 min. Resuscitation was carried out with 4× volume of Ringer lactate. The animals were killed at 2 h after resuscitation. A subset of animals subjected to T-H procedure was treated with resveratrol 10 min after the start of resuscitation while another group that received resveratrol was treated with sirtinol 5 min after the start of resuscitation. The enzymatic activity of SIRT1 in the left ventricular tissue was assayed by a fluorimetric assay by using the SensoLyte Green SIRT1 assay kit (AnaSpec, Fremont, CA, USA). This assay was appropriate for the study, since our objective was to test tissue SIRT1 activity, and was performed per the manufacturer’s directions. The acetylated p53 peptide substrate provided with the kit was incubated with sirtuin-containing tissue protein samples. Deacetylation of substrate sensitizes it to the color developer releasing the green fluorophore. The fluorescence signal generated was in proportion to the amount of deacetylation of the lysine. Western blot was performed by standard procedures as described before (5). Nuclear extract of left ventricular tissues was prepared and resolved on a polyacrylamide gel and transferred to a polyvinylidene difluoride (PVDF) membrane, and Western blot was carried out by standard methods. For protein detection, primary antibodies to SIRT1 (Santa Cruz Biotechnology, Santa Cruz, CA, USA), PGC-1α (Santa Cruz Biotechnology), PDK1 (LifeSpan Bioscience, Seattle, WA, USA), Bip (Cell Signaling, Boston, MA, USA), PDI (Cell Signaling), β-actin (Abcam, Cambridge, MA, USA) or histone H1 (Millipore, Billerica, MA, USA) were used. Appropriate secondary antibodies (Santa Cruz Biotechnology) conjugated to horseradish peroxidase were used along with a chemiluminescence detection system (Amersham, Piscataway, NJ, USA) and autoradiographed. The radiography bands were scanned and quantified by densitometry. The assay was carried out by using a kit obtained from Mitosciences (Abcam). Briefly, the enzyme was immunocaptured within the wells of the microplate, and complex I activity was determined by monitoring the oxidation of NADH to NAD+. The simultaneous reduction of a chromogen results in increased absorbance at 450 nm, with increasing activity. Left ventricular tissue extracts were used as the enzyme source. An oligonucleotide binding assay using the enzyme-linked immunosorbent assay (ELISA) technique was used to detect and quantify the activation of transcription factor NRF2 (ActiveMotif, Carlsbad, CA, USA). Briefly, an NRF2-binding canonical antioxidant response element (ARE) sequence-bearing oligonucleotide was adsorbed to ELISA plate wells. A nuclear extract containing NRF2 protein was prepared by using another kit (ActiveMotif) as per the manufacturer and incubated in the wells to allow NRF2 binding to its target oligonucleotide. Bound NRF2 was detected by using a specific antibody, a secondary antibody conjugated to horseradish peroxidase was added and the analyte was determined colorimetrically by using a spectrophotometer. Data were analyzed by using Graph-Pad prism software (GraphPad, La Jolla, CA, USA). Statistical significance was calculated by an unpaired t test with the Welch correction. Our studies have demonstrated that left ventricular functional decline after T-H was associated with declined tissue ATP levels (5). To determine the mediators of mitochondrial function after T-H, SIRT1 activity was measured, and the results demonstrated a significant decline after T-H (Figure 1). However, resveratrol treatment along with resuscitation fluid restored SIRT1 activity. Administration of sirtinol before treating with resveratrol significantly reduced the salutary effect due to resveratrol (Figure 1). SIRT1 enzyme activity after T-H and resveratrol (RSV) treatment. Activity of SIRT1 enzyme was measured in total protein extracts from left ventricular tissues of rats subjected to sham or T-H procedure. RSV or sirtinol (Stnl) and RSV were administered in a subset of the T-H group. Results were normalized to sham levels, and the significance was calculated by the unpaired t test with the Welch correction. n = 4–7; bars = mean ± standard error of the mean (SEM). *p < 0.05 compared with sham. Nuclear translocation of transcription-altering factors is functionally significant. Therefore, we tested the level of SIRT1, PGC-1α and c-Myc in the nuclear extracts of left ventricular tissues. There was a significant decrease in nuclear SIRT1 and PGC-1α after T-H, whereas c-Myc protein level was significantly increased (Figures 2A–C). When resveratrol was administered 10 min after the start of resuscitation, the protein level of SIRT1, PGC-1α and c-Myc in the nuclear fraction was restored. However, administration of sirtinol before treatment with resveratrol mostly abolished the effect because of resveratrol. Modulation of PGC-1α, SIRT1 and c-Myc proteins after T-H and RSV treatment. Nuclear protein extracts were prepared from left ventricular tissues of rats subjected to sham or T-H procedure. 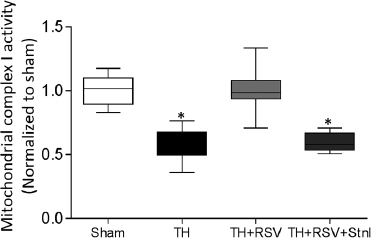 Resveratrol (RSV) or sirtinol (Stnl) and RSV were administered in a subset of the T-H group. The protein extracts were resolved on an acrylamide gel, and Western blot was carried out with antibodies to PGC-1α (A), SIRT1 (B) or c-Myc (C). Bands were quantified in relation to β-actin and normalized to sham levels, and significance was calculated by unpaired t test with the Welch correction. Histone control for A and C are from the same gel; n = 4–6; bars = mean ± SEM. *p < 0.05 compared with sham. Mitochondrial complex I assay, a measurement of mitochondrial function, demonstrated a significant decrease in the left ventricular tissue after T-H (Figure 3). The declined mitochondrial function was not observed in resveratrol-treated animals, whereas sirtinol abolished the beneficial effect of resveratrol on mitochondrial complex I activity. Mitochondrial complex I activity after T-H and RSV treatment. Complex I activity was measured in the left ventricular tissues of sham-treated or T-H-treated animals administered resveratrol (RSV) or sirtinol (Stnl) and RSV. The complex I activity was determined as described in Materials and Methods. The enzyme activities as indicated by optical density were normalized to sham values, and significance was calculated by unpaired t test with the Welch correction. Bars = mean ± SEM. *p < 0.05 compared with sham. The active form of NRF2 in the nuclear extract that binds to AREs was measured by using the TransAM method. 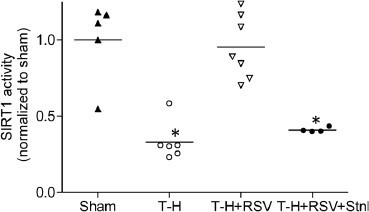 As shown in Figure 4, NRF2 protein in the nuclear extract of left ventricular tissue was significantly decreased after T-H, when compared with the sham. However, resveratrol treatment restored the NRF2 levels, whereas the rats treated with sirtinol demonstrated levels similar to those observed in rats subjected to T-H but not treated with resveratrol. 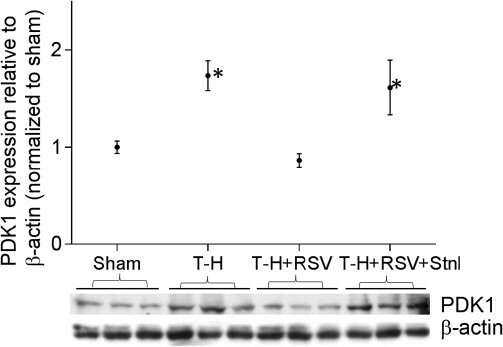 As shown in Figure 5, there were increased levels of endoplasmic reticulum stress proteins Bip and PDI in the left ventricular tissues after T-H, and resveratrol restored the level of these proteins to sham levels. DNA binding NRF2 component in the nuclear fraction. The DNA binding NRF2 protein level in the nuclear extracts of left ventricular tissues from rats subjected to sham or T-H procedure and treated with resveratrol (RSV) or sirtinol (Stnl) and RSV was determined by using an ActiveMotif kit. Statistical significance was calculated by unpaired t test with the Welch correction. n = 4–6; bars = mean ± SEM. *p < 0.05 compared with sham. O.D., optical density. Alteration of Bip and PDI levels after T-H. Total proteins were tested for Bip (A) and PDI (B) levels by Western blot. Statistical significance was calculated by unpaired t test with the Welch correction. n = 4–6; *p < 0.05 compared with sham. Vertical box and Whisker plots were generated by GraphPad Prism software. To further understand the functional alteration of mitochondria-glycolysis axis after T-H, PDK1 protein level in the left ventricular tissue was tested by using Western blot. The experiments demonstrated a significant increase in PDK1 after T-H, which was abolished by resveratrol treatment (Figure 6). Treatment with sirtinol before resveratrol administration markedly reduced the effect of resveratrol on PDK1 level. Modulation of PDK1 level after T-H and RSV treatment. PDK1 total proteins in left ventricular tissues were tested by Western blot. Tissues from rats subjected to sham or T-H procedure and resveratrol (RSV) or sirtinol (Stnl) and RSV treatment were used. Band intensities were determined by densitometry in relation to β-actin levels and normalized to sham. Statistical significance was calculated by unpaired t test with the Welch correction. n = 4–6; bars = mean ± SEM; *p < 0.05 compared with sham. Shift in glycolytic-mitochondrial energetics after T-H. Glucose undergoes glycolysis to produce pyruvate. Pyruvate may be either converted to lactate or enters mitochondria and is converted to acetyl CoA. Acetyl CoA undergoes oxidation in the citric acid cycle, and energy-rich electrons are supplied to the electron transport chain, leading to the generation of energy-rich ATP molecules. In aerobic respiration, pyruvate to acetyl CoA is the major pathway (A). In the deficiency of oxygen, such as in hemorrhage, PDK1 is activated, leading to the phosphorylation and inhibition of PDH, promoting conversion of pyruvate to lactate (B). Dotted lines indicate the less active pathway, in the respective conditions. T-H causes whole-body hypoxia, decreased tissue nutrient availability and changes in cellular energetics. Mitochondrial functional alteration after T-H is well described (25,26). Therefore, a better understanding of molecular pathways that control mitochondrial function is important in developing therapeutic strategies for T-H. Our previous experiments have demonstrated that an SIRT1 activator, resveratrol, restores left ventricular contractility after T-H. We also have found a negative correlation between c-Myc and SIRT1 (20). However, alteration in the activity of SIRT1 after T-H or the effect of resveratrol treatment on SIRT1 activity was not known. During shock and low flow conditions, the cell membrane transport of Na+ and K+, transmembrane potential, cellular ATP and cyclic nucleotide levels and other phenomena are significantly altered (8,27,28). Studies have demonstrated mitochondrial functional deterioration after T-H and restoration after treatment with agents such as estradiol (29,30). Antioxidants such as MitoQ and MitoE have also demonstrated improved mitochondrial respiration and protective effects (31,32). Nevertheless, the energetic imbalance due to decreased mitochondrial function leading to declined ATP level after T-H and improvement after SIRT1 activation is not clearly understood. Our experiments now demonstrate that SIRT1 activity is significantly decreased after T-H (Figure 1), and this observation is consistent with our previous studies that have shown a significant decrease in the expression of total cellular SIRT1 protein after T-H. Resveratrol treatment augmented the expression and activity of SIRT1. Resveratrol, a phytophenol, is a known allosteric activator of SIRT1 and, therefore, the mechanism of its action likely involves activation of SIRT1 enzyme activity (33,34). 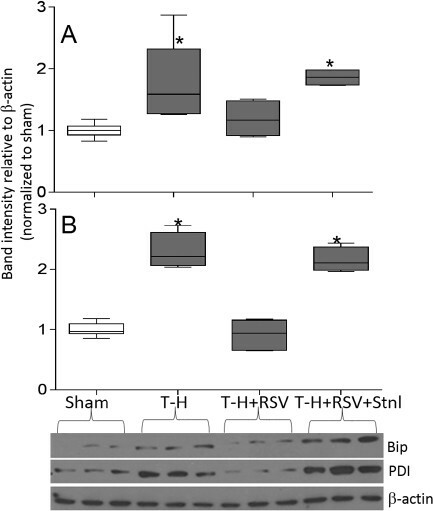 Our previously published results have demonstrated improved left ventricular contractility when resveratrol was administered in rats subjected to T-H (5). It is now clear from our experimental results that there is a functional deficiency of SIRT1 after T-H, and resveratrol treatment was able to restore activity and expression of SIRT1. However, it is still unresolved whether the increased protein level observed after resveratrol treatment is a consequence of SIRT1 activation or resveratrol is modulating other critical genes. Previously, we reported a decrease in total tissue PGC-1α and augmentation of c-Myc after T-H and a reversal of these expression changes in resveratrol-treated animals (5). PGC-1α is known as a mitochondrial biogenesis factor that coactivates the PPAR family of transcription factors. In the adult cardiomyocytes, PPARα is expressed in high levels, and its activation induces expression of genes involved in fatty acid transport and oxidation (35,36). PPARα modulates the expression of genes critical in mitochondrial biogenesis and function. Therefore, nuclear localization of PGC-1α may closely indicate the transcriptional control of PPARα. 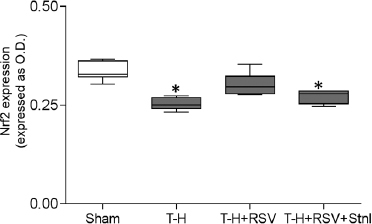 Our experiments, as shown in Figure 2A, show that nuclear PGC-1α exhibits a significant decrease after T-H, compared with sham levels, and resveratrol treatment was able to restore the levels. The protein level of c-Myc in the nuclear fraction demonstrated an inverse relationship compared with nuclear level of SIRT1 (Figure 2C). Mitochondrial complex I activity is one of the parameters that indicates functional oxidative phosphorylation. As shown in Figure 3, we found a significant decrease in mitochondrial complex I activity after T-H. This result is consistent with the observed decrease in ATP after T-H and normalization with resveratrol treatment (5). The concomitant decrease in the nuclear PGC-1α observed after T-H is likely related to the decreased mitochondrial function. One of the downstream nuclear factors affected by PGC-1α is NRF2, which modulates the transcription of genes in the cellular antioxidant systems. In the absence of appropriate signals, NRF2 remains bound to Kelch-like ECH-associated protein (KEAP)1 in the cytoplasm, but dissociates and translocates to the nucleus in response to signals and forms a trans-activation complex by dimerization with other bZip proteins before binding to AREs on the DNA (37). Our oligonucleotide-binding experiments using nuclear protein fraction demonstrate a significant decrease in the DNA-bound NRF2 protein after T-H, whereas resveratrol treatment resulted in an expression pattern similar to that in sham-operated animals (Figure 4). A number of genes involved in redox reactions and inflammation are regulated by the transcription factor NRF2; these genes include superoxide dismutase (SOD), heme oxygenase (HO-1), glutathione reductase (GR) and glutathione peroxidase (Gpx) (38). The decreased DNA-associated NRF2 at 2 h after T-H and resuscitation indicates a deficient antioxidant process and continued secondary injury to the organ systems. The experiments thus far have shown a potential effect due to T-H-induced injury that leads to a declined activity and expression of SIRT1 resulting in declined mitochondrial function. Our experiments also indicate that resveratrol can ameliorate endoplasmic reticulum stress after T-H (Figure 5). Decreased cellular oxygen availability after severe hemorrhage is likely a critical factor in mitochondrial functional decline, due to oxygen requirement for oxidative phosphorylation. Under low oxygen availability, cellular energetics demonstrate a shift from mitochondria-derived ATP to glycolysis. To determine this, we tested the expression level of the enzyme PDK1 and found augmentation of its level after hemorrhagic injury (Figure 6). The mitochondrial gatekeeper, pyruvate dehydrogenase (PDH), catalyzes the oxidative decarboxylation of pyruvate in the conversion to acetyl CoA (39). Phosphorylation of PDH by PDK1 results in the inactivation of PDH leading to decreased availability of acetyl-CoA for mitochondrial oxidation, thereby inhibiting the link reaction between glycolysis and citric acid cycle (Figure 7). However, when resveratrol was administered along with resuscitation fluid, the protein level of PDK1 was similar to that in the sham group, indicating that resveratrol treatment enabled entry of glycolysis-derived carbons into the citric acid cycle, which indicates improved mitochondrial function. These results demonstrate a shift in cellular energetics from mitochondria to glycolysis after T-H and a reversal when resveratrol was administered along with the resuscitation fluid (Figure 7). In a previous study, we observed significant upregulation of both gene and protein expression of PDK1 in cardiomyocytes subjected to hypoxia (17). These results and reports from other laboratories demonstrate the critical role of PDK1 under hypoxic conditions, in conserving energy or coping with the deficiency of oxygen. The deficiency of oxygen due to hemorrhage is also coupled with the decreased nutrient availability, and therefore it is possible that the suppression of pyruvate catabolism does not result in pyruvate accumulation, any more than observed in the sham animals. Although this speculation needs to be tested, it is a likely scenario because increased pyruvate is known to activate SIRT1 (40), but SIRT1 expression is decreased after T-H. Importantly, the role of SIRT1 in activation/inactivation of PDK1 is unknown. Our earlier investigations using the RoMitoChip have demonstrated increased expression of the oxygen-sensing transcription factor, hypoxia-inducible factor (Hif)1, alpha subunit (Hif1a), after T-H (19). Elevated c-Myc, together with Hif-1, may also play a role in the suppression of mitochondrial oxidation, in favor of the glycolytic process (19,20,41). However, these pleotropic effectors of energetic balance are likely downstream of SIRT1, since acetylation/deacetylation of critical proteins including c-Myc may be controlled by SIRT1. Moreover, execution of SIRT1 function is predominantly posttranslational, although it also effectively controls transcriptional processes through the deacetylated proteins such as critical transcription factors. Understanding the mechanism of energetic shift after T-H is important in devising better therapeutic strategies. Such information will allow us to look for specific targets involved in these pathways to alter the outcome after T-H injury. We conclude that augmentation of SIRT1 level and activity may have a beneficial effect in improving the cardiovascular function after hemorrhagic injury. There is a likely switch from mitochondrial energetics to glycolysis after T-H, as indicated by the elevated PDK1 and declined mitochondrial complex I activity and NRF2 levels after T-H and resuscitation. Resveratrol-mediated augmentation of SIRT1 activity may be significant in restoring glycolytic-mitochondrial energetics pathway and organ function after T-H. The authors acknowledge the support of National Institutes of Health Grants GM101927 (to R Raju) and GM 39519 (to IH Chaudry).